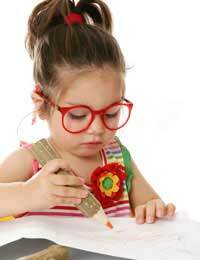 Kids begin to learn basic writing skills the very first time that they pick up a crayon. Those initial scribbles help little ones to enjoy the feel of a writing instrument as well as the sense of accomplishment that comes from putting something down on paper. There are a number of stages that children go through on their way to becoming accomplished writers. Two Year Olds: In the beginning their lines are typically uncontrolled and random, with children simply enjoying the process without working toward a specific goal. Three Year Olds: By the time that they are three, children begin to exercise a bit more control in their writing efforts, sometimes following direction to write across the page, although the figures that they write are unlikely to be recognisable letters. Four Year Olds: Older threes and young four year olds begin to distinguish between drawing and writing, attempting to mimic the letters that they see in books and on worksheets. The letters are likely to be quite misshapen, but may begin to look a bit like the alphabet. Older fours should be able to write their names and can also copy words and letters. While the letters are usually fairly accurate, reversals are common. Five Year Olds: Five year olds may enjoy writing made up sequences of letters to represent words. They have an understanding of how certain letters sound and may be able to answer correctly when they are asked to identify the beginning letter of a word by repeating it aloud. Five through Seven Year Olds: Writing becomes much more accurate and organised, with children writing in lines from left to right and utilising simple punctuation. Parents should provide encouragement for budding writers as well as offering their children a variety of writing papers and instruments. The goal isn't perfection, but merely to have fun. As the child progresses in their writing abilities, accuracy and tidiness will follow. Early writers often do well to use specialty lined paper that helps the kids to keep uniformity in their letter sizes, but it takes several months of learning before kids consistently stay within the specified lines. Writing over the top of letters that a parent has written on a page is a good way for kids to learn, with them later copying the words on a separate line. In the beginning, it helps for parents to show their children how to correctly hold a pencil, which the child will probably find awkward at first. By holding their own hand over that of their child, parents can demonstrate the proper technique. Some parents prefer to begin with upper case letters while others choose lower case. Either choice is fine, but children should be taught one whole set before moving on to the other to avoid confusion. As with all things, practice makes perfect, so parents should look for ways to get their kids writing. Children enjoy creating books of their own that they can "read" to family members and then proudly display. Parents can write down the stories that their young children dictate to them and as the kids become more proficient writers, they can write their own stories down, with parents helping only with the spelling. Sidewalk chalk, paint, markers, and collared pencils are all fun for kids, too, and kids who are enjoying themselves will be likely to practice frequently!